How to Choose a pickleball Paddle? Let this article help you find out which characteristics are the most important when choosing a pickleball paddle. Pickleball! 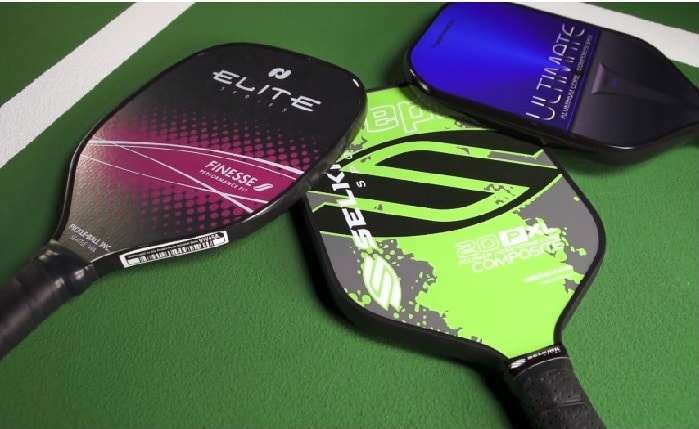 This sport is getting so popular that each year manufacturers are bringing in some of the best pickleball paddles that beat their predecessor. This is a common question that most of us face. With a great variety of pickleball paddle available, purchasing the right one for you may seem like a daunting task. However, this does not need to be the case. Most likely, you have already tried your friend’s paddle and thinking of purchasing the same one. Or, you would like to do some comparisons and check out other paddles that are available. What makes buying a paddle confusing is due to its technical factors like paddle surfaces, composite, graphite etc. Paddle cores like polymer, aluminum, Nomex, sizes, price and many more. That’s all too much. You don’t have to worry about all of them. We’ll try to make this guide short and simple so that you can narrow down the options to find the best paddle for your playing style and preference. Now, there are many different characteristics of a pickleball paddle that you want to learn and research before making your final decision. In this article, we are going to talk about the three most important aspects of choosing a pickleball paddle. Number one is weight. It is the first thing you’ll notice when you pick up a pickleball paddle and the most important aspect of choosing your paddle. Paddles range from about 6 – 8.5 ounces with the most popular weight being in the 7.5 to 7.7-ounce range. There are paddles that weigh below 6 ounces and above 8.5 ounces but the majority of the paddles fall into 6 to 8.5-ounce ranges. A lighter paddle will give you more maneuverability and quicker reaction to the ball while a heavier paddle offers more plow through power and stability on off-center shots. Now, #2 most important aspect of choosing a pickleball paddle is grip size. It typically ranges from about 4 inches to 4.5 inches. Someone with smaller hands will usually gravitate towards a smaller grip. Usually, 4 to 4.1/8th grip size to maximize wrist snap and range of motion. Someone with medium size hands with usually chooses a four and a quarter grip and player with large hands would go with a 4 with 3/8th size and above. Now, the best way to find your grip size is to place your hand on the grip. Your index finger should fit between the fingertips and the palm of your hand. This allows enough room for maximum wrist snap for power and spin and range of motion in your wrist. Last but not least, paddle core. There are three main cores of pickleball paddle. The latest addition to the pickleball technology is being polymer. A plastic like blend that is known to be the softest and the quietest of the three cores. This core is great for touch, control and highly sought after by players of all skill levels. This is a cardboard like material that is known to be the first lightweight material added to the pickleball paddle. This is the loudest and hardest of the three cores. It is sought after by players looking mostly for power. The third core is aluminum. It is a bit louder but great core for power and touch. Aluminum cores are a bit softer than Nomex which provides a combination of precision and touch. These are the basic key factors to consider before making your first purchase. Hope you now know how to choose a pickleball paddle.